After an All American career in 1977 and 1978, big Bob Golic was originally drafted by the New England Patriots in the 2nd round of the 1979 draft from Notre Dame. At 6-2, 264, during some points he played right inside linebacker in the Patriots’ 3-4 defense. After a not so spectacular 3 seasons- where he started only 12 games, Bob would sign with Cleveland where he’d find his home amazingly as a space eating nose tackle. Golic would play the majority of his career in Cleveland making 14 sacks over 7 seasons. Bob would be named to the ProBowl from 1985-1987 and AP in 1985 and 1986. 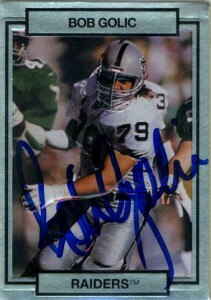 He’d start 97 games for them before leaving Plan B for the Los Angeles Raiders in 1989. The Raiders would move Bob to defensive tackle where he’d start for another 2 seasons before an injury plagued finale in 1992. Bob after retirement went into acting and broadcasting. He’d play a stint on the TV show “Saved By the Bell”, was into talk radio as well as did commentary for the XFL and recently, opened a sports bar and grille in Cleveland. Bob Golic also is the older brother of former Philadelphia Eagle and host of “Mike & Mike in the Morning”, Mike Golic. Nice, big broad strokes on the signature with a full press on the autograph the whole way through. 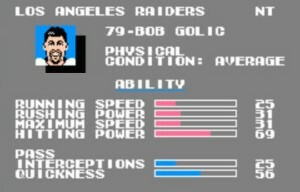 They say sometimes you can tell things about a personality by their handwriting and Bob has a gigantic ‘G’ for ‘Golic’. The lower zone of the ‘G’ (the huge lower part of the letter,) and the straight line are indicative of his confidence and his independence. The shape of his ‘o’ in his first and last name are indicative of his openness and willingness to talk. Interesting stuff.